​In this article, we short-list the top thigh compression sleeves that are currently on the market. Our aim is to provide you with the essential information needed to decide which is the best thigh compression sleeve for your needs. If you work out regularly, a thigh compression sleeve is one of the items that should not miss out on your kit and for a good reason. These sleeves support and protect your thighs and sometimes your knees while giving you better blood circulation and enabling you to exercise more. You may be one of the many people that suffer poor blood circulation and we would not want to be a part to such statistics, and we bet neither do you; a thigh sleeve can ensure that especially if you run often. The market is awash with thigh compression sleeve brands. Though these sleeves have been in the market for a long period, most people have not known their importance and thereby choosing the best thigh compression sleeve may be a painstaking process. Do not worry though, we have you covered. Below, we have researched and reviewed top sleeves in the market to enable you to make the right choice. Use the criteria provided below for the thigh compression sleeve reviews to be able to choose one that is right for you. Why Do You Need Thigh Compression Sleeves? What Will Thigh Compression Sleeves Not Do? MoJo Thigh Compression Sleeve was created for professional athletes and as such, it is offered with premium quality features. This sleeve offers recovery after strenuous workout sessions. Unlike other thigh compression sleeves, this sleeve is designed with graduated compression allowing it to offer better blood circulation to the wearer when performing any sport activity. It is a long sleeve, covering the ankle, the knees and the thighs; which makes it versatile. The sleeve offers between 20 and 30mmHg graduated compression; the compression is highest at the ankle and reduces as the sleeve moves up to the thighs. This way, the sleeve offers enough support to all the parts of the leg it covers without being uncomfortably tight. Better yet, the graduated compression battles gravity to force blood back to the heart and the lungs. The sleeve comes in four sizes to accommodate all wearers. To make it a better fit, it is offered with a non-slip silicone grip that ensures that the sleeve holds its position even during strenuous workout sessions. It is made of 72 percent Nylon and 28 percent Lycra; this makes the sleeve warm and odor resistant. Even better, the material wicks away moisture/sweat keeping the wearer comfortable. To get the correct size, the manufacturer advises taking ankle and calf measurements. Most Amazon.com reviewers have praised this sleeve with most appreciating its great fit, its long length, its moisture wicking property and its ability to relieve wearers of ankle, quad, hamstrings and knee pain. A few customers complain that the washing instructions provided do not go well with those wearers who need to use the sleeves every day. The Copper Compression Recovery Thigh Sleeve was designed to offer support while relieving the wearer of pain. It is one of the sleeves in the market that has been infused with copper. With copper infused, the sleeve is able to reduce inflammation, promote blood flow, enhance growth and sustenance of connective tissues and generally hastens the recovery from inflammation, strains and other conditions. Sleeves infused with copper are touted as the best and therefore the reason Copper Compression Recovery Thigh Sleeve has grown in popularity among athletes. If you suffer sore and stiff muscles, this might be a good option for you. 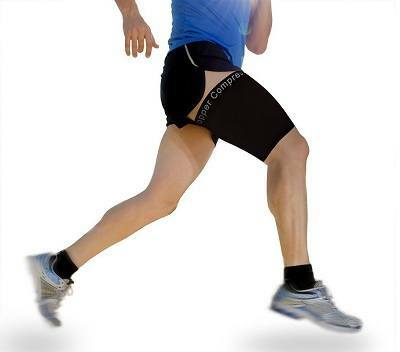 It is made of nylon, a fabric that retains heat and keeps the leg warm during cold weather; it is therefore able to remedy hamstring, groin and quad muscle problems. The nylon material also enhances the strength of the sleeve making it to withstand everyday use and everyday washing. Offered with 100 percent money back guarantee, customers who are not satisfied have nothing to worry about. This sleeve has been highly applauded on Amazon.com. Most reviewers praise the comfort of the sleeve; holds up well without being too tight. One advantage that stands out is that the sleeves can be used for long periods of time without causing discomfort; some reviewers say that at times, you may not feel the presence of the sleeves on your leg. Given their high copper content, some buyers have used them for varicose vein, especially pregnant women. A few reviewers were not comfortable with the nylon feel. The Bauerfeind Sports sleeve was designed in Germany as an upper leg sleeve. It is ideal for running, workouts and other sporting activities including normal every day workouts. The sleeve is made of a highly elastic knitted fabric, which ensures that it offers enough compression without being uncomfortably tight on the skin of the wearer. With a wide edging band, it has been fitted with a silicone dotted band. The sleeve is able to offer exceptional comfort as it fits perfectly on a wide range of leg sizes. Like its name suggests, the sleeve is short covering only the upper leg. To keep the sleeve comfortable, it is offered with breathable high-quality microfiber that keeps the skin cool during hot weather and feels soft on the skin; the material keeps the skin warm without being overly hot. Better yet, it is machine washable and highly durable. Washing instructions are provided together with the package. Like other sleeves, the Bauerfeind Sports Compression Sleeve exerts the necessary medical compression to promote blood circulation and enhance oxygen supply to your muscles. With this, the sleeve ensures that you can endure more exercise, experience less fatigue and hasten recovery time. This thigh compression sleeve has a good rating on Amazon.com with most reviewers citing its great performance, ease of use, its good grip, its durability and its price. Some customers have however had a problem with sizing, especially those with big thighs; this problem has been attributed to the sizing chart provided by Bauerfeind Sports. Overall, the reviews on Amazon encourage buyers to go for this product. People with venous insufficiencies, diabetics, the elderly and those who have not been active for a long period are most likely to have circulation problems. When such happens, inflammation and conditions such as varicose veins will affect them. 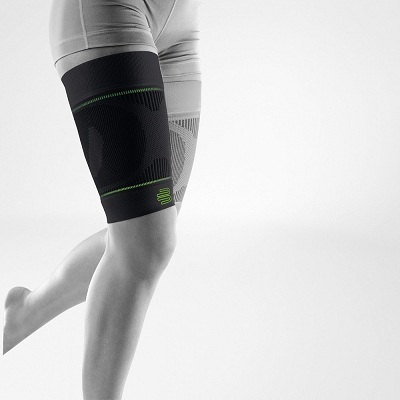 You can use thigh compression sleeves to reduce the swelling and improve blood flow. With a sleeve, you will feel less discomfort and can resume workouts even with the swelling on your thigh. Even better, by wearing a compression sleeve, you can prevent swelling altogether. When the compression sleeve increases blood circulation, more oxygen is delivered to your muscles. Your body is therefore able to get rid of the lactic acid and other toxins that accumulate in your muscles during a strenuous workout session. The sleeves keep your muscles in a stable position reducing soreness, muscle strains and muscle damage among other conditions. Strengthen your bones as well to avoid injuries while doing sports or exercise. Though most compression sleeves are made of Nylon, a material that is prone to destruction, the compression sleeve offers protection to your skin by being impervious to bacteria and chemicals. This makes the sleeve odor free and safe for your skin. The material wicks sweat away keeping your skin dry and protects your thighs from scratches and bug bites. Granted, some manufacturers have resulted to designing long thigh compression sleeves that cover not only the upper leg but also the bottom leg below the knees. For oxygen to be delivered to all body cells and for you to stay comfortable while training during winter, you need to stay warm; this is what these thigh sleeves offer. You do not have to be a professional athlete to wear them as even ordinary runners will find them comfortable. With the right amount of compression, the sleeves will ensure no fatigue or cramping. Thigh compression sleeves, like discussed above, increases blood circulation and hastens the process of recovery; beyond that, there is nothing else scientifically proven that these sleeves can do. However, marketing language will try hammering it on people that these sleeves will cure venous insufficiencies, remove cellulite or even give you the ability to run faster, lift more weights or jump higher. What you need to note is that these sleeves will make your training more comfortable and in the process improve your performance. You will need a doctor for venous insufficiencies such as varicose vein. The first question is why you need thigh compression sleeves; is it for warmth, protection, medical condition or relief. If you suffer a medical condition, you might want to check with your doctor first before buying a sleeve. You may need a sleeve to ease the pain or swelling you get from hours of training every day. For these cases, you need to consider the factors explained below. Compression sleeves are offered in five compression levels based on progressive compression on the body. Compression is measured in mmHg. To be on the safe side, for compression levels over 20mmHg, consult your doctor. Sleeves with a compression level between 8 and 15 mmHg are ideal for relieving minor aches from sitting all day. Between 15 and 20 mmHg, the sleeve is ideal for minor swellings and heavy sensations. For pregnant women who need to relieve minor issues that result from varicose or spider veins, compression sleeve with between 20 and 30 mmHg are ideal. Compressions between 30 and 40 mmHg are good for chronic venous issues while heavy compressions between 40 and 60 mmHg are for those with severe medical conditions. Its either you need compression for support or you need it for a medical condition. Thigh compression sleeves may be made of Nylon, Spandex, Lycra or rubber or a combination of two of these materials. Some manufacturers have also used wool. You need a material that is easy on your skin, easy to wash, offers enough compression without restricting blood flow and is breathable but with enough warmth. Sizing is normally a problem with many thigh sleeve buyers. Fortunately, you will be provided with a sizing chart to enable you choose the correct size. The chart tells you where to measure and what size matches your measurements. If you ask us, the MoJo Sports Recovery Thigh Compression Sleeve is the best. We choose this sleeve based on its sturdiness as a compression sleeve, its versatility, its durable construction and its price. It is long in size and supports your ankles, knees and thighs and is offered with graduated compression enabling it to offer enough compression while being easy on your skin. It is offered with a warm, breathable fabric that is easy to wash. With its light weight, you can wear it all day and not feel uncomfortable. If this sleeve does not tickle your fancy, choose another best thigh compression sleeve from the list up there.